Join a Santa Snowshoe in the sequoias, just ahead of Christmas. Join a Santa Snowshoe in the sequoias on the weekend before Christmas. The Dec. 22 meet-up spot is Wuksachi Lodge, while you'll want to head to John Muir Lodge on Dec. 23. FINDING SANTA IN A MALL, or at a school, or in a restaurant, or inside the grand lobby of a hotel? All so charming, especially because the setting ups the splendor. After all, Mr. Claus typically occupies some sort of throne-like chair, a seat that's been covered in red velvet. Also? There's very often an adorable, not-real fireplace nearby, hung with colorful stockings, and wrapped packages, too, and the other gewgaws and glittery elements that add to a great Santa portrait. AND YET? Sometimes it is rather magical to visit with Kris Kringle in a more natural setting, especially since, as we know, he calls a very wild and nature-amazing place home: the North Pole. And while getting to the North Pole isn't likely feasible for, well, anyone on short notice — plus, we wouldn't want to disrupt the whole toy-making scene, which heats up in cold December — there are other naturally beautiful places, closer by, to see him. THE SEQUOIAS... are one such spot, and, on Saturday, Dec. 22 and Sunday, Dec. 23, 2018, Santa Claus will call upon the big trees for one energetic, hard-to-forget outing. It's the Santa Snowshoe, it is free, and it is called "... an outstanding opportunity to capture an amazing family photo and build some winter recreation skills." While there's no cost to join, you will want to rent snowshoes, to join the merry fun, so keep that in mind. There are details here, but also note that the snowshoe will start at Wuksachi Lodge on Dec. 22 and John Muir Lodge on Dec. 23. 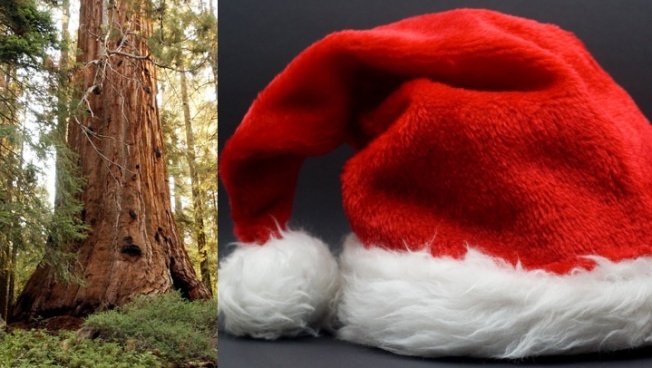 The Jolly Old Elf and some of the oldest and tallest trees around? You know this'll be pretty epic. ALSO EPIC? The chance to take a picture with Santa in, wait for it, a cave. That's what's happening at Black Chasm Cavern on Saturday, Dec. 15 from 11 a.m. to 3 in the afternoon. For more details, contact the National Natural Landmark, which may be found at Volcano, in Gold Country.